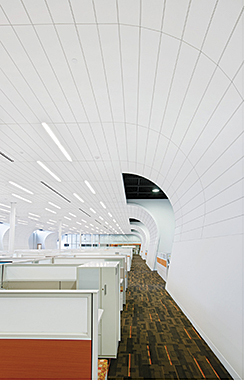 Optima Plank Ceiling Systems have a noise reduction coefficient of 0.90 to 0.95 and articulation class of 180 to 190. The light reflective panels are offered in a variety of standard and custom sizes that allow maximum design flexibility, including ceiling to wall transitions. Feature a fine textured, non-directional DuraBrite surface for increased durability and light reflectance.